At first, we see nothing, and only the sounds of the night orient us; chirping crickets, the gentle but steady movement of water as a boat glides through the darkness. Then torchlight begins to illuminate patches of the screen, displaying a flock of birds taking flight from the trees hanging overhead and the placid waters of the surrounding lake. The torchlight rests on a nearby boat, and the camera glides towards it to find a man lying motionless inside - not dead, as it turns out, but perhaps even more eerily, asleep, napping on the lake in the dead of night and the middle of nowhere. 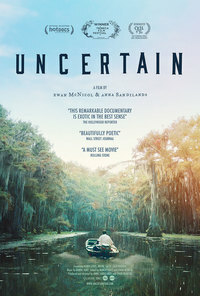 It’s an evocative and atmospheric opening to this extraordinary documentary, unencumbered by establishing on-screen text or voiceover narration, and it introduces us to the titular rural community of Uncertain - a tiny U.S. town on the Texas-Louisiana border with a population of just 94. If it also feels something straight out of David Lynch, and subsequent scenes featuring pampered raccoons living alongside family pets, a potential U.F.O sighting and the inevitable but staggering offshoots of the town’s distinct name (imagine practicing at The Church of Uncertain! ), remain in line with a certain milieu of all-American weirdness; Twin Peaks-meets-Winter’s Bone by way of Harmony Korine’s Gummo perhaps. But both recent history and the filmmakers ensure that Uncertain is far deeper and more wide-ranging than a sideshow peek into a secluded pocket of the U.S.A. This is Trump’s America now, and we see in the forgotten residents of Uncertain a microcosm of American society. Directors Ewan McNicol and Anna Sandilands make sure to feature a range of the community’s colourful inhabitants, but focuses in on three residents: elderly African-American fisherman Henry Lewis, ex-convict and amateur hunter Wayne, and 21 year-old Zach, the trio respectively symbolising Uncertain’s past, present and future. These fascinating subjects reveal their lives to the camera, including their hopes and regrets, with the candidness of those who are not accustomed to having their voices heard. Similarly to O.J. :Made in America, the most lauded documentary of last year, these individual stories are used to delve into the many facets of modern America, delving into aspects of race, religion, addiction, crime, work, poverty and family with a staggering richness. The film’s scope, which we initially assume will be limited to that found at the margins of the normal, comes to seem boundless, and is especially admirable when the brisk 80 minutes of running time is considered. Although recent political developments may tempt viewers to see the film primarily in light of the socio-economic, Uncertain (first shown in 2015) ultimately has even loftier resonances in mind, narrowing in on man’s relationship to nature and its existential implications. The film’s other narrative through-line concerns the encroaching plant life that may destroy the lake and with it Uncertain’s livelihood. The town’s precarity is as much ecological as economic (“if the lake dies, the town dies” says one concerned resident) and the film captures that fluid, ever-shifting relationship between man and nature, both interdependent and combative, from the aforementioned opening sequence. This is where the film’s striking visual style comes into play, McNicol’s cinematography consistently capturing the beauty of both the natural and manmade varieties while refusing to flinch from the casual slaughter of animals for sport and livelihood that underpins life in Uncertain. This destruction is not unthinking, but opens avenues for contemplation. Former drug addict Wayne traces his belief in a higher power to the realisation that in nature “everything fights for its life”. As the residents of Uncertain fight, they also contemplate, maintaining aspirations, dreams and a sense of meaning in the face of, yes, the uncertainty that comes with being alive in the world today. Uncertain is a rich and beautiful film, and to reduce it to “timely” seems to do it a disservice. It is, by design, timeless. This review was published on March 15, 2017.